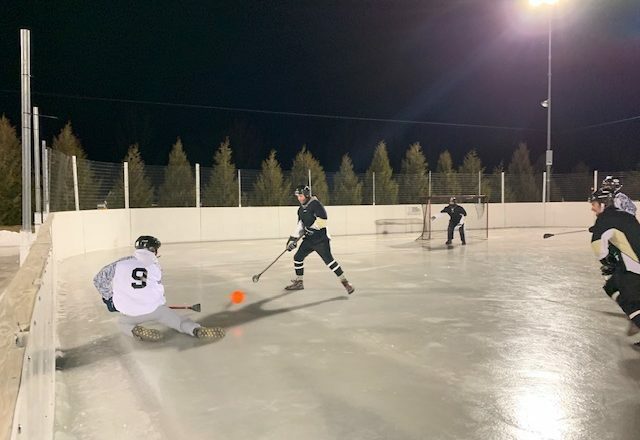 Northern Door Broomball League play kicked off Jan. 9, 2019, but now the season is in doubt. Photo by Myles Dannhausen Jr. Sister Bay has suspended operations at the Teresa K. Hilander Community Ice Rink after manager Joe Balderotta abruptly resigned Monday, Jan. 14. Assistant Administrator Janal Suppanz said the village does not have staff to flood the rink and manage the warming house and is investigating options to re-open the facility. Northern Door Broomball League play has been suspended indefinitely. The league has played its games at the rink on Wednesdays for more than 20 years.